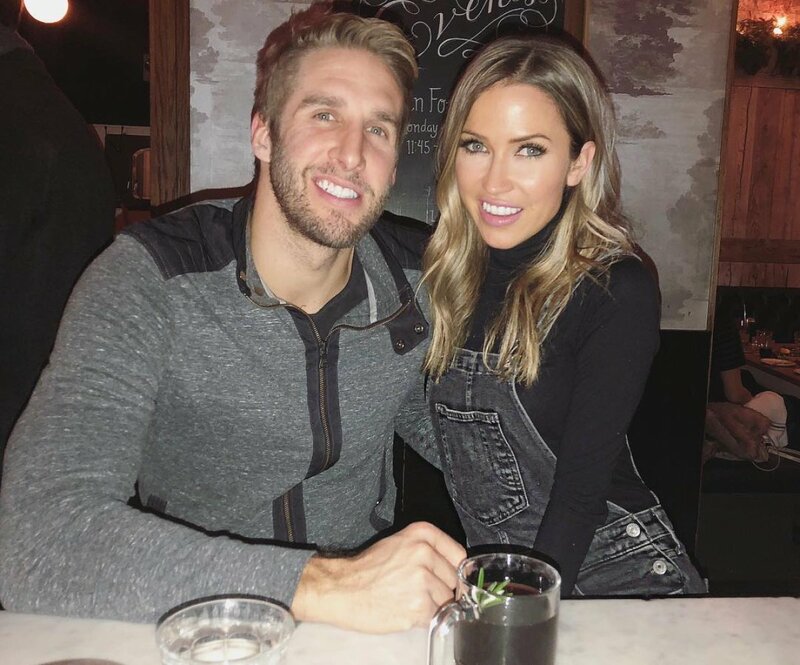 The Bachelorette alum Kaitlyn Bristowe is addressing breakup rumors in regards to her relationship with Shawn Booth head-on. "To be honest, I didn't think I would have to do this, but also I shouldn't be surprised. I was on a reality show that showed me getting engaged to somebody. [People] will become invested in us and our love story," Kaitlyn said Thursday on her Off the Vine podcast. Kaitlyn and Shawn got engaged during the Final Rose Ceremony of The Bachelorette's eleventh season back in 2015, and the couple has been honest with fans they've been in no rush to tie the knot in their three years together. But rumors have swirled recently Kaitlyn and Shawn decided to call it quits on their engagement, mainly because Kaitlyn has been spotted without her diamond engagement ring and she's been staying with her family in Canada for weeks. So what is the status of Kaitlyn and Shawn's romance? According to the former The Bachelorette star, they are still together and doing just fine. "I haven't been wearing my engagement ring, and without noticing, people have pointed out I haven't been liking [Shawn]'s photos on Instagram," Kaitlyn said with a laugh on her podcast. "Why are we basing people's relationships and happiness on Instagram likes? I haven't been liking my sister or best friend's photos either, because to be honest, I've kind of been doing a little social media cleanse for myself... It's hard that I feel like I have to constantly explain myself." Kaitlyn said she hasn't been active on social media because she's been working on herself, and then she dove into the nitty gritty of what's been happening in her love life. "So here's the truth. I'm in Canada because every single year I have made a promise to myself and my family that I will come up every August and enjoy downtime with the people that I love in a country that I love. Family is so important to me. Relationships in general are very important to me. I put relationships first... I am motivated by relationships," Kaitlyn explained. "Shawn did not come up with me because the guy just bought a gym. He bought a business. He has started something huge. He is the most dedicated person I've ever met. He is so dedicated to making this Booth Camp run smoothly and be successful... If you start a business, like, he's going have to be there for months, maybe even a year of him just committing himself to that." Kaitlyn said when Shawn isn't running a gym, he needs to travel for work events. Meanwhile, Kaitlyn has events of her own she must attend to. "We are both so busy, and unfortunately that means we're spending all of this time apart. If you've ever been a person who is running a successful brand or business and you're with someone who is doing the same -- but in a different career path -- you know times can be tough," Kaitlyn explained on Off the Vine. "You are both always away, you're exhausted at the end of the day, and sometimes the relationship isn't being put first. But does that mean, oh, you call it quits? No. You love the sh-t out of each other and you work through it and you work on yourselves to be better." Kaitlyn said times have been "tough" and things are not always going to be "smooth sailing," but she said it's important to "get through those hurdles and enjoy the good times." "We don't want to overshare [on social media], but Shawn and I are 110 percent committed to each other and, yes, we are still together," Kaitlyn confirmed. As for why she hasn't been wearing her Neil Lane engagement ring, Kaitlyn reasoned, "I don't feel like we are an engaged couple some of the time because when you are engaged, you plan a wedding and you set a date." She continued, "Shawn told me when we got into a limo after his proposal, he said, 'That is not the way I ever planned to get down on one knee.' He didn't want to do it five minutes after I broke up with another guy, who had just proposed to me. It's pretty understandable stuff." Kaitlyn and Shawn therefore apparently decided Kaitlyn should take her ring off at some point and wait for Shawn to propose marriage again so she wouldn't see it coming. "Will that be any time soon? Probably not. I never want Shawn to feel pressure, and I don't want to feel pressure... [But] that's when we'll have answers and we'll be able to give you a wedding date," Kaitlyn noted. Kaitlyn concluded in her message to fans, "We're both committed to making this work no matter what you read or what you hear... We are two very dedicated, committed people... Things are hard, but we are together and we are committed." Kaitlyn gave Shawn her final rose on The Bachelorette instead of runner-up Nick Viall, who went on to star on a season of Bachelor in Paradise as well as The Bachelor's 21st season.